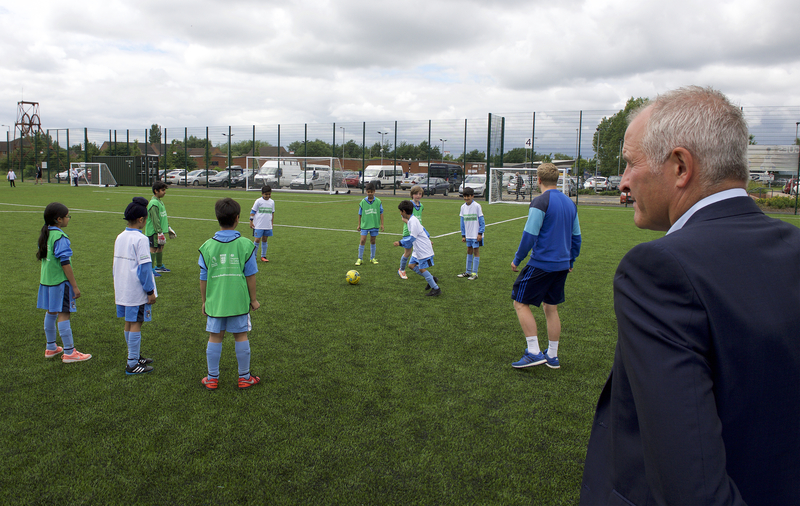 Steve Bull MBE, former England and Wolverhampton Wanderers FC striker, opening the new all-weather pitch in Walsall alongside junior footballers. 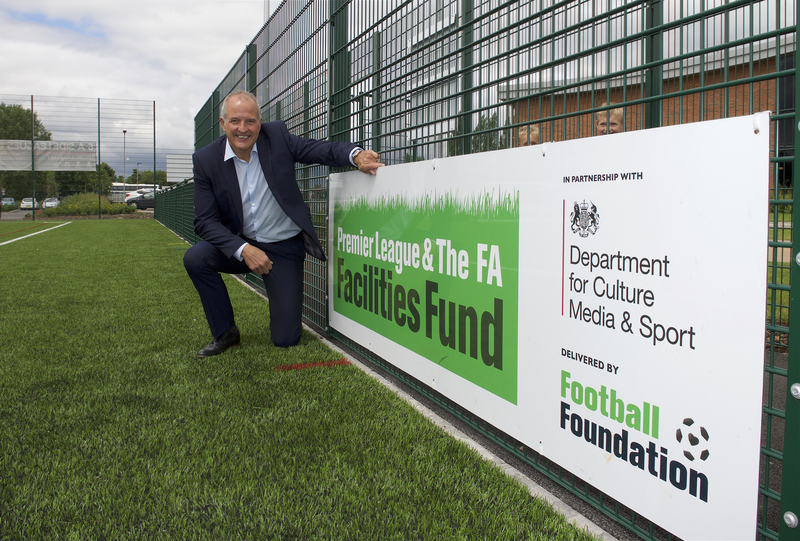 Steve Bull MBE, former England and Wolverhampton Wanderers FC striker, opened a state-of-the-art third generation (3G) artificial grass pitch (AGP) in Walsall today (Tuesday 13 June 2017). The brand new floodlit 3G AGP will provide a home for Walsall Wood Saints JFC, who previously played and trained at four different venues across the county. The club, formerly known as Shire Oak Saints JFC, has teams ranging from Under-6 to Under-18 level and recently merged with Walsall Wood FC. This merger, coupled with the opening of the all-weather pitch, has seen overall team numbers grow to 28. The new pitch is already hosting competitive matches for Walsall College, the Staffordshire Veterans League and Rushall Olympic of the Junior Premier League. Several other grassroots clubs are also using the new pitch including: Brownhills Colts; Pelsall Villa Colts and ASP Victoria. From September 2017, the Walsall Junior Youth League will be using the pitch as a centre for their 5v5 and 7v7 matches. The project has already forged links with the Albion Foundation, the charitable arm of Premier League side West Bromwich Albion, who are delivering their Baggies Soccer Centre on Saturday mornings. This initiative provides local youngsters with a pathway into Walsall Wood Saints JFC’s Under-6 and Under-7 teams. Additionally, Walsall Council delivers weekly Walking Football sessions at the new facility, for men aged over the age of 50. These sessions encourage participants to enjoy the social aspects of the game, whilst also experiencing the benefits of weekly exercise. Walsall Council has also teamed up with Walsall Housing Group and local Police Community Support Officers to deliver free weekly sessions to local young people on Friday evenings. Walsall Council worked in partnership with the Staffordshire FA to secure a £250,000 grant from the Premier League & The FA Facilities Fund. 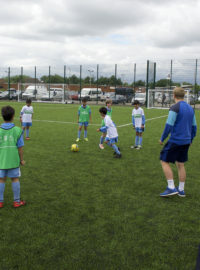 The grant has enabled Walsall Council to open the new grassroots sport facility, which is expected to raise overall sports participation in the area by 126%. Alongside the Staffordshire FA and Football Foundation, Walsall Council have compiled a five-year Football Development Plan, which is a vision of how sport will be played on-site with an emphasis on increasing participation. The plan predicts an increase in football participation for the 14-25 age group of 493%, and projects a 416% rise in the total number of players. Walsall Woods Saints JFC hope to grow the female section of their club, which would also benefit the female participation for Walsall Wood FC. It is expected that the opening of this new facility will result in a 124% increase in overall female sport participation for the area. Since 2000, the Football Foundation Funding Partners’ investment has provided 251 grants worth £17.8m towards grassroots sports projects worth over £34.1m across the whole of Staffordshire. Steve Bull MBE, who scored 306 goals for Wolves during his 13 years with the club, and represented England at the 1990 World Cup, said: “This is a brilliant new facility that will benefit the local area as a whole. I know how important grassroots football is and the money from the Premier League, The FA and the Government, delivered by the Football Foundation, is vital to the sport. “Sites like this 3G AGP help all members of a community to experience the benefits of sport, and I can see that this one will be getting a lot of use! I’m especially glad to hear about how the pitch is going to help local teams, such as Walsall Wood Saints JFC, to deliver top-quality training sessions. Councillor Ian Shires, Walsall Council Cabinet Portfolio Holder for Community, Leisure & Culture, said: “This fantastic £12m facility is already having a real impact on improving Walsall residents’ activity levels and encouraging grassroots sport. Since the doors first opened in August 2016, there have already been more than 400,000 visits. 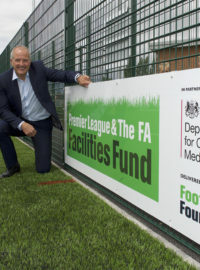 Paul Thorogood, Chief Executive of the Football Foundation, said: “I am delighted that a grant from the Premier League & The FA Facilities Fund has enabled Walsall Council to open a floodlit 3G AGP. This development will provide a real boost to sport in the local area. A special thanks goes to Steve Bull MBE, for officially opening the new facility.